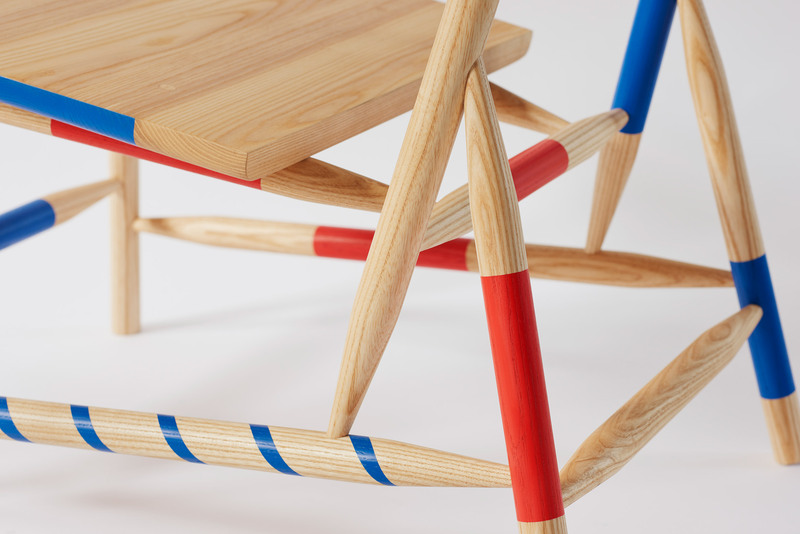 London designer Rio Kobayashi has reinterpreted the colourful markings found on Mikado pick-up sticks as a pattern for his new East West furniture collection. Kobayashi, a London-based Japanese-Austrian designer, presented his East West collection during this year's London Design Festival. Inspired by his experience of both far-eastern and western countries, the designer wanted to bring the both together – showing the culture's crossover points in a "playful" way. He looked to the Mikado game, which originated from Hungary, but is often thought to be Japanese because of its name. "The game seems to be Japanese but has its name and worldwide fame from a clever company, which invented the name in the 20th century in Europe," said Kobayashi. Also known as pick-up sticks, Mikado sees players take turns to remove sticks colour-coded with different values from a pile – without moving or touching the others. 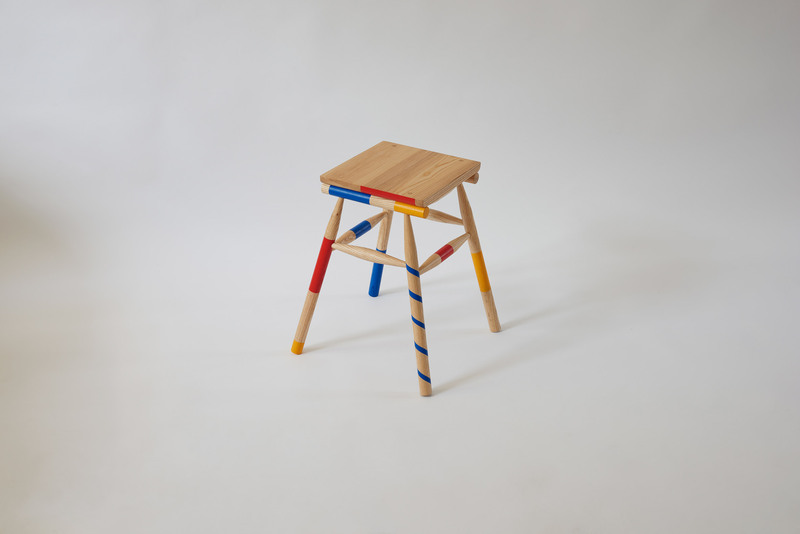 The two pieces in the collection, a stool named Mikadokun and a chair named Mikadochan, are designed as a nod to the sticks used in the game. 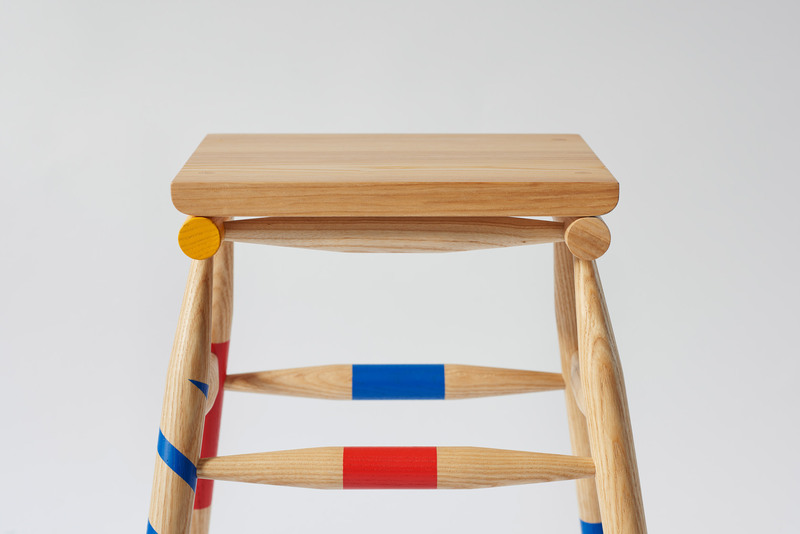 Made from ash, each feature legs that have been created from turned wooden poles, a technique that gives them a pointed end reminiscent of Mikado. This reference is furthered by hand-painted sections in red, blue and yellow colours – the shades used to mark different values in the game. "I was very passionate about colours as a child," said Kobayashi. 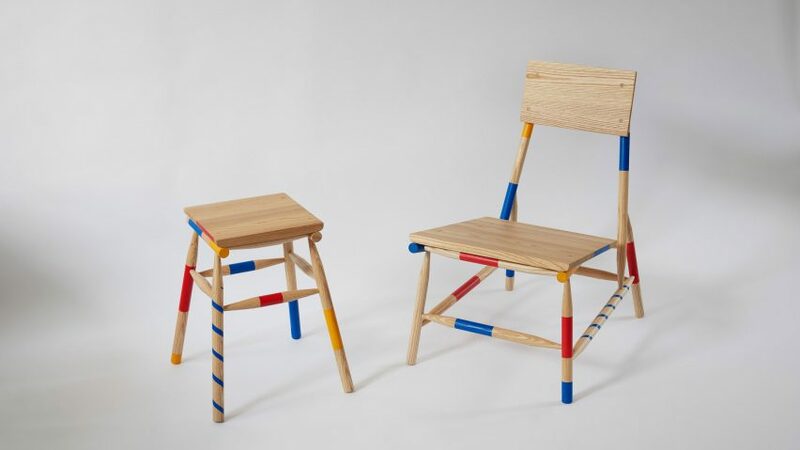 "This furniture series also remind me of childhood memories." This is the first time Kobayashi has shown his works in London. 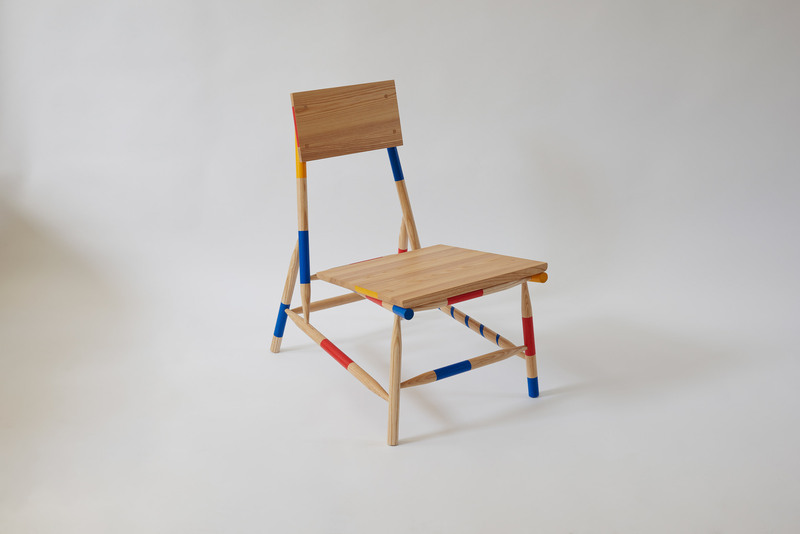 The designer grew up in Japan, and moved to Europe when he was 18 – where he undertook an apprenticeship in cabinet making alongside working in different design studios. Since then, he's lived in Milan, Berlin, Innsbruck and Paris. This year, he moved to London to set up his own workshop and studio. Kobayashi's East West collection was on show at London Design Fair, which took place during the city-wide London Design Festival last week. 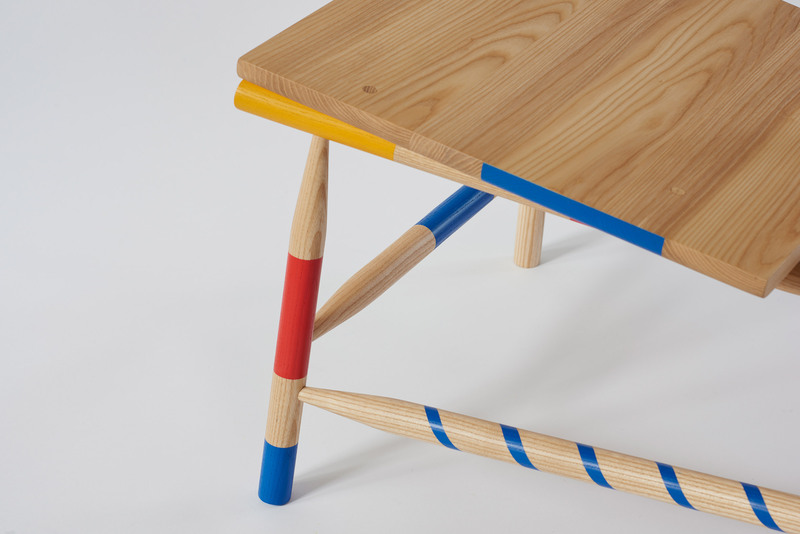 Other pieces launched during the festival include Philippe Malouin's sofas made from rounded forms, and Another Country's furniture range that is designed to be passed down through the family. Photography is by James Harris and Rio Kobayashi.